Arizona Sunshine originally came out on Oculus and Vive at the end of 2016. It was highly regarded as one of the best VR games at the time but PlayStation VR owners felt left out of the fun. Six months later, the brightly lit zombie shooter is finally releasing for PSVR, tailored specifically to the variety of control options that it offers, though there have been some concessions made in bringing it to the platform. Waking up in a shabby encampment, the survivor makes his way out into the bright Arizona sunshine to seek survivors. The bright light is a distinction that sets it apart from most other zombie games. The only other one that comes immediately to mind is Dead Island. You can choose from any of the three control methods (DualShock 4, Move, or Aim), with each presenting their own advantages and disadvantages. The DualShock 4 means no buying any extra peripherals if you don’t have them and can do both the teleporting and free movement. The problem is that you are limited to a single gun in your hands, and it can feel unnatural trying to lift the DualShock to aim down sights. 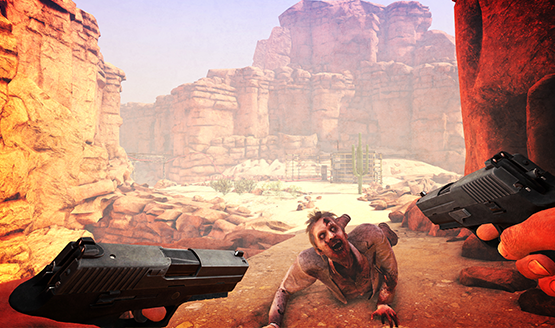 The Aim controller is supported in Arizona Sunshine, giving that real natural feeling of holding a weapon, and still supporting both the free movement and teleporting. Here you are again limited to a single gun, and it can feel a little odd aiming a handgun in game as if it were a rifle, though I got used to it quickly. The Move controllers allow you to dual wield like the original PC version, but limits the ability to walk around freely (you can hold X to move forward, but don’t have analog sticks to turn. You physically turn your body to turn in game which can get you turned around, and being turned away from the camera tracking you can begin to cause tracking issues). Being limited isn’t a bad thing. It’s very well implemented, and no matter which control option you pick, they’ve done a great job at developing each of them separately, so none of them feels like the tacked on option. You can play whichever you want and still get the Arizona Sunshine experience. The fun of virtual reality is feeling present in the experience, so aiming is done by physically moving the gun to your eye and looking down the sights. Getting used to the feeling of having to physically aim independent of our view is different from standard first-person shooters, and is something that still amazes me about VR. To this end, it’s why tracking is so important. If it starts to drift, so will your aim, and the immersion can be ruined. There were a couple of times I had to recalibrate the Aim controller (done by holding down the options button), but it was always a quick and easy fix if I ever felt my targeting was off. One of my biggest pet peeves in games is arbitrary distractions that don’t serve to enhance the gameplay or the world. Arizona Sunshine is full of objects that can be interacted with. Guns, ammo, and even food for health are all an important part of gameplay. Then you’ve got the random balls, cans, hammers, axes, crowbars, and other useless items you can pick up. You can hold them, look at them, drop them. You can even throw these items, but they don’t do anything for gameplay. You can’t pick up a hammer and use it to melee a zombie’s brains out. You can’t throw a crowbar and hope for a critical hit. It will pass right through them, and then you are back to using whatever hand cannon or SMG you have equipped. It makes you wonder why they even bothered programming these objects at all. One of the most fun parts is being swarmed by zombies and being forced to change your tactics. Where I thought I was methodically taking down single zombies with perfectly placed headshots, suddenly a rushing horde will force me to abandon all reason, fanning the hammer like a cowboy or burst firing with an SMG like a 1920s mobster, and there goes all of my ammo. 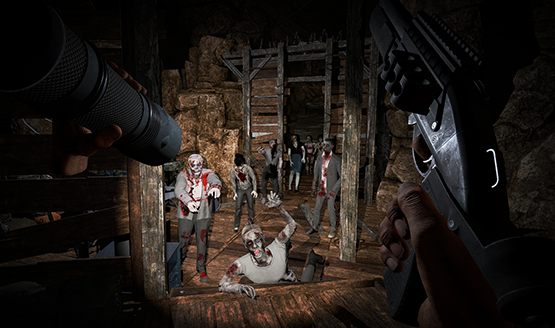 Arizona Sunshine is constantly challenging expectations with fun new events, like placed sniper rifles to clear a far away crowd or a mounted gatling gun for what feels like a never ending horde. The main campaign will take around four hours to finish on normal difficulty. Adding replay value is co-op for the campaign and a horde mode that can either be played alone or with friends. In a game where the only other living thing for miles technically isn’t living, the lone survivor’s monologue provides the entertainment and narrative. As you move through this zombie shooting gallery, you delve into the psyche of the main character as he deflects the weight of his situation with humor until he reaches a breaking point. You’ll watch as hope is given and taken away repeatedly, and what may seem like just some casual banter while splattering zombie brains across the Arizona desert is actually the zombie apocalypse version of Cast Away. Arizona Sunshine’s main character even has his own Wilson, calling every zombie he meets Fred and having a one sided dialog as if they are his very own volleyball friend in this bleak existence. In the move to PlayStation VR it does seem some trade-offs were made. Though I haven’t played the game on either of the PC platforms myself, judging by gameplay videos it appears that the graphics are worse. While I may have been impressed with the PSVR version’s graphics back in December, there have been a lot of high quality and graphically impressive VR games that have released since. It’s not to say that Arizona Sunshine on PSVR has bad graphics, not be any stretch of the term. It’s just that it visually appears to be a middling game, neither stunning nor looking terrible. There is notable object and texture pop in that can occur too, though I was playing on a standard PS4. Playing on a PS4 Pro is said to have a better graphical experience. Arizona Sunshine review code provided by publisher. Reviewed on PSVR using a standard PS4. For more information on scoring, please read our Review Policy.